Rita Minehan CSB. Ireland. �Braiding the Flame of Brigid�. Helena Fouhy CSB. N.Z. 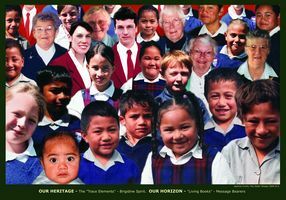 Historical background for New Zealand�s first Website. Anne Phibbs & Trish Hannaray. CSB. NZ. Valued suggestions and Proof Readers. Monica Landy CSB who created the Brigidine �Journey and Story�. Mrs Jeannie Curtis for the production of the website, her creative presentation, artistic skills and patience. Tim Donaldson for additions to the website.